Determine the region for which a DVD is designed by looking for a small standardized globe icon in the middle of the disc that indicates the region number. If the disc can be played in more than one region, it will have more than one number on the globe icon. If the disc does not have any regional coding, “ALL” is printed over the globe icon or there will be no globe icon at all. 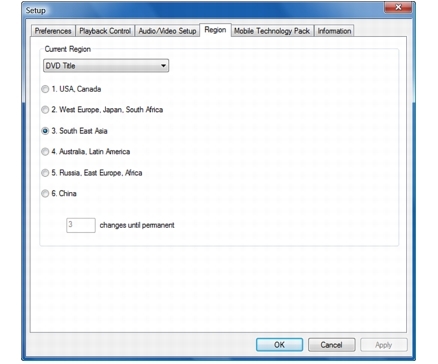 1 On the Setup dialog box, click the Region tab. 2 Choose a region, and then click OK.